short girl, long island. : Sugar Junkie. I am such a sucker for anything kawaii - have been since I was a youngin'. Some of you might be asking yourself, what the heck is kawaii? It basically translates to "cute" in Japanese. When I came across Pajamie's Sugar Junkie creations, I spent a good twenty minutes drooling over her Etsy shop. One day, she asked if any bloggers would like to review some Sugar Junkie accessories, + I jumped at the chance! I was sent a plethora of goodies in the cutest wrapping, with an even sweeter card! 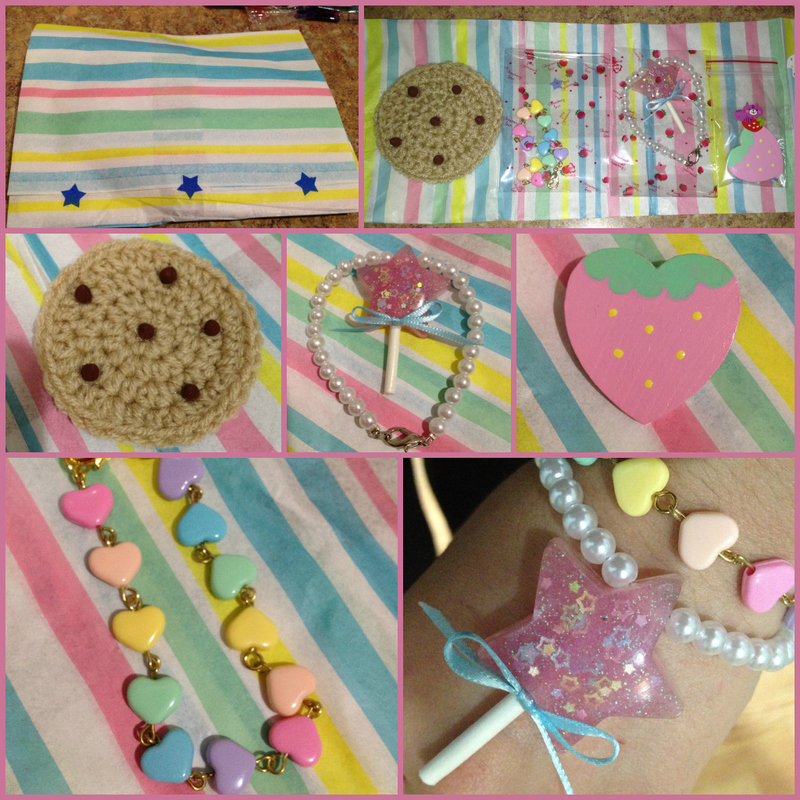 What you are feasting your eyes on are the Crochet Chocolate Chip Cookie Brooch, Star Lollipop Bracelet, Pastel Strawberry Hand Painted Wooden Heart, and a Pastel Rainbow Valentine Bracelet. Each item is so fun + you can't help but smile when you see them. When I saw the Cookie Brooch, I immediately thought of my favorite little cookie monster, Julia. She would be so excited to have this, so I'm saving this to put in with her Christmas present. The Star Lollipop Bracelet reminds me of Rainbow Brite, which was one of my favorite shows growing up. The Strawberry Heart is really cute + reminds me of Strawberry Shortcake, which was another one of my favorite shows. The Rainbow Valentine Bracelet reminds me of hair accessories I had when I was younger - my hair was down to my behind until I was nine or ten, so my mom was always using super cute barrettes + hair ties to keep my mane in check. Once I can justify making purchases again [Erich gives me the evil eye if I even mention shopping - I'm on a budget until further notice], I plan on snagging a Cat Coffee Cozy. It will keep me from wasting sleeves at Starbucks, in turn helping to save trees. I'm torn between the blue + orange [not pictured]. 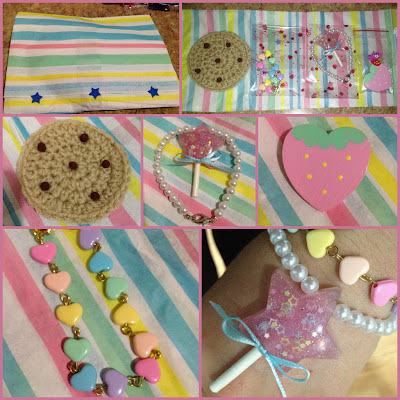 When you have a moment, head over to Sugar Junkie + check out some of Pajamie's recent creations. Pajamie also has a really fun blog, which you should swing by as well. UPDATE: Sugar Junkie has added a coupon, just for the blog! Use the code shortgirl10 and get 10% until Sunday, September 23. 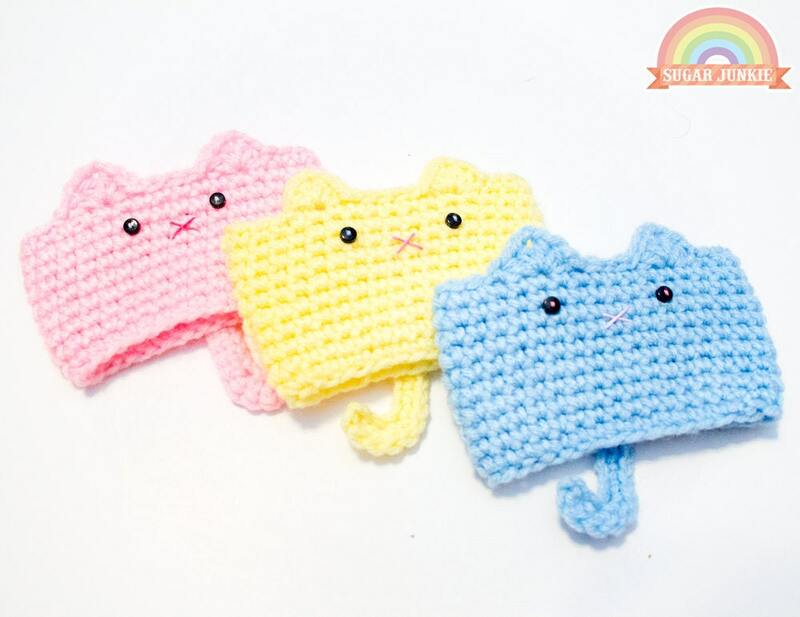 The knitted cat coffee sleeves are darling! I love the blue one! Pajamie just added a special 10% off coupon [shortgirl10], which is good until Sunday, so I just ordered the Orange Sherbet one! Eek! I love the Cat Coffee Cozy! Once my own spending suspension has been lifted (I went a little wild shopping IG closets last week) I am totally going to get one. Thanks for introducing me to this cute, errrr, kawaii, shop!